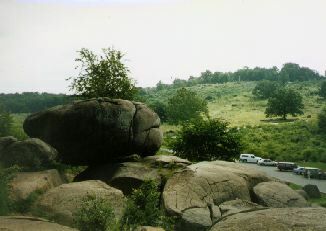 This is a recent view of Little Round Top taken from the Devil's Den. The Slaughter Pen is located just beyond the growth behind the row of automobiles. Note that the foliage today is denser than at the time of the Battle--this is was true for the battlefield generally but the National Park Service has spent time and money to restore, as much as practicable, the Battlefield to its condition on 1-3 July 1863..